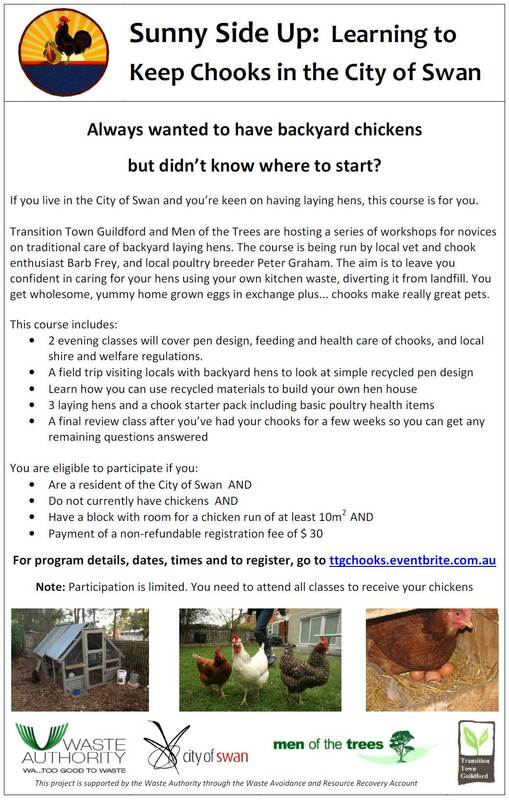 Registration is open for Transition Town Guildford’s Sunny Side Up Project. There was an article on page 7 of the Midland Reporter the other month about our success in receiving a grant from the Waste Authority (see below). You can see the announcement from the Minister for the Environment here. The grant will enable us to run a series of workshops on everything you need to know about keeping chooks in the backyard. At the end of the program, participants will receive three chooks. The idea is based on a successful program in Belgium, where local authorities were able to reduce tonnes of organic waste going to landfill by giving away chickens to local residents. Apparently each chook can consume 150 kg of kitchen waste a year! This project is supported by the Waste Authority through the Waste Avoidance and Resource Recovery Account. We also acknowledge the generous support of Men of the Trees for auspicing our grant. 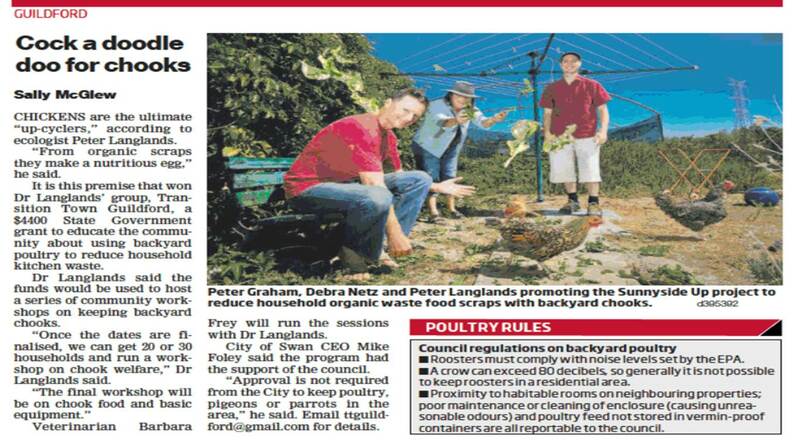 This entry was posted in Food, Media, Take Action, Waste & Recycling and tagged City of Swan, Community grant, keeping chooks, Midland Reporter, WA Environment minister, Waste Authority WA, Waste avoidance and resource recovery account. Bookmark the permalink.